Mantis will be able to sense biomarkers from samples harboring antigens of infectious diseases (e.g. blood) using modified bacteria. These bacteria are able to report the presence of an antigen by making use of the Cpx signaling system native to E. coli to connect the sensing module (affinity body) to the reporter module (split fluorophore or chromoprotein). This way, visualization of antigen presence can be achieved. To design an optimal molecular system for Mantis, we have considered three possible visualization strategies (Figure 1). By combining insights from kinetic models of these systems together with data from the wet-lab, we aim to create Mantis with the best possible characteristics. We used Yellow Fluorescent Protein (YFP) as placeholder signal protein to study the kinetics of these systems. To learn more about the molecular workings of the systems, check out our Specific Visualization page! Figure 1: Three different coupling setups of Mantis. System 1) Production of YFP signal relies on phosphorylation of two CpxR molecules by CpxA that senses the presence of antigen using CpxP. System 2) Signal production relies on interaction of CpxR and CpxA upon (de)phosphorylation of CpxR by CpxA. System 3) Signal production relies on the release of split YFP upon phosphorylation of CpxR by CpxA. The TEV protease bound to CpxR cleaves the split YFP from CpxA, allowing it to dimerize in the cytosol. Here, we demonstrate how we studied the kinetics of three different Cpx setups and give recommendations based on their speed, signal intensity, sensitivity and robustness. In other parts of this website, we show how the affinity body is fused to the Cpx system, how the Bimolecular Fluorescence Complementation (BiFC) is connected to CpxA and how the split fluorescent proteins perform. Additionally, we show how interaction between this model and the wet-lab data lead to increased Mantis performance. The initial concentrations for the components CpxAP, CpxR, CpxR-P and CpxP was set to 1, and an initial concentration of all other species was set to 0. In system 3, the initial concentration of CpxAcP and CpxAnP was set to 1. We generated 500,000 sets of parameters for each of the three systems using the Latin hypercube sampling function in Matlab (lhsdesign()), with parameter values ranging between 0 and 1. These values were then converted to a log-uniform distribution ranging from 0.0001 to 10 to resemble a natural distribution of kinetic rates. 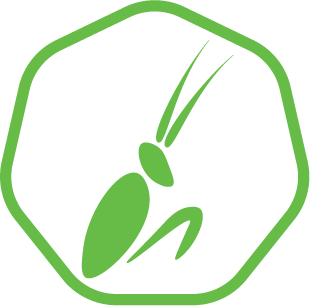 To determine what parameters the ideal performing Mantis must have, we score each parameter set based on the above described criteria: speed, signal intensity, sensitivity and robustness. The first two criteria can be directly calculated from the models. For all parameter sets we generated in the previous step, we simulate what happens to each of the system components over time. Using the optimal parameters, Mantis should have system properties that fulfill the criteria mentioned above. In order to quantify what constitutes a good system, we constructed a scoring function that can capture this desirable system behavior. The second and third system rely on interaction between CpxA and CpxR upon phosphorylation or dephosphorylation by CpxA. However, dephosphorylation takes place when CpxA is still inhibited by CpxP. This way, maturation of the split YFP halves can occur without antigen presence. This means Mantis can produce a signal even though the sample does not contain disease markers. Figure 2: Overview of mechanism inherent to system 2 and 3 which results in a YFP signal without antigen being added. System 2: Upon dephosphorylation of CpxR, the two YFP halves might interact and maturate. System 3: Upon dephosphorylation of CpxR, the TEV protease might cleave a YFP halve from CpxA, which can maturate in the cytosol with another released YFP halve. Figure 3: Overview of scores of all parameter sets for each system. Blue dots represent the YFP and speed scores of all individual parameter sets. Green dots represent the 500 sets with highest YFP score and the 500 sets with the highest speed score. Red dots represent the sets scoring high on both scores, called 'Union', of the best 5% YFP and best 5% speed scoring sets. Figure 3 shows that all systems are capable of quickly producing high YFP concentrations under the right parameter set. The extent of the speed scores are different for all three systems though, with system 1 being able to reach a maximum production speed of 0.35 and system 2 a speed of 3.0. The number of sets belonging to the 5% highest scoring sets for both the YFP and speed score, so the sets producing both a fast and intense signal (hereafter referred to as the 'union'), vary per system. System 1 produced the largest union of 8948 sets, followed by system 2 (556 sets). System 3 produced the smallest union, of 91 sets. This difference might indicate that system 1 is more likely to produce both a fast and intense signal given a random parameter set, although the other two systems can reach higher speeds. To determine what properties Mantis should have to get a high fluorescent signal and/or a fast signal, we studied the parameter values of the best scoring YFP and speed sets. The distribution of each parameter value was plotted for each individual parameter (Figure B). Parameter k3, k4, k5 and k6 show clear shifts from the original value distribution. Figure B: Distribution of each parameter value in the best scoring parameter sets and union. The original distribution of values over the sets is displayed in black. Click for parameters. These properties are found for both the sets that produce a fast signal, sets that produce a high signal, and sets that can do both (which we will refer to as the “union” of these sets). The fast sets have relatively higher k3, k4 and k5 values, whereas the sets resulting in an intense signal have a more moderate increase from the original distribution. These parameters appear to not be vital in order to obtain a high YFP signal. This shows the robustness of this first system. The distribution of each parameter value in our second system was plotted for each individual parameter (Figure C). Parameter k1, k3, k5 and k6 show clear shifts from the original value distribution (black). Figure C: Distribution of each parameter value in the best scoring parameter sets and union. The original distribution of values over the sets is displayed in black. Click for parameters. The sets giving the fastest signal had low k5 and high k6 parameter values, compared to the sets reaching both a fast and high signal (union, yellow). This is related to the scoring function, as it this does not take into account the difference in YFP produced by induced CpxA (k3) and non-induced CpxA (k6); just the speed of overall YFP production. Even though a high k6 value decreases the net level of YFP reached after antigen addition, it makes YFP maturation faster. The sets resulting in both a high and fast signal (union) generally have low values of k6 and high values of k3, giving a high, fast and specific signal. The prevalence of each parameter value was plotted for each individual parameter (Figure D). Parameter k1, k8, k10, k13, k14 and k16 show clear shifts from the original value distribution. 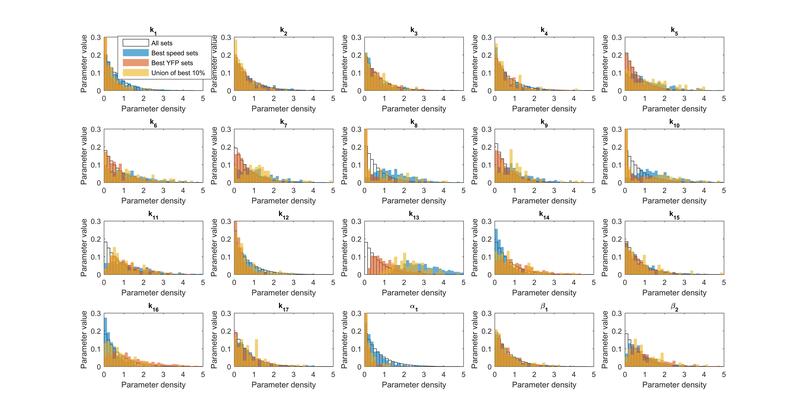 Figure D: Distribution of each parameter value in the best scoring parameter sets and union. The original distribution of values over the sets is displayed in black. Click for parameters. We can intuitively explain this result, as for a high and fast signal, high amounts of YFP need to maturate. A possible explanation of the roles of these parameters might be their influence on CpxR availability. For a fast signal, YFP halves need to be released quickly, with or without presence of antigen. Both CpxR phosphorylation and dephosphorylation is needed. For a high signal, only the YFP halves released in presence of antigen matter. This requires only CpxR phosphorylation. Rates k14 and k16 lower phosphorylated CpxR (CpxR-P) concentrations and higher CpxR concentrations. These parameters should be high for a specific and high signal. Rate k1 shifts these concentrations the other way around, and should thus be low. Rates k8 and k10 facilitate quick release of YFP halves in presence of CpxR-P. To save CpxR-P for these reactions, as no CpxR is phosphorylated under uninduced circumstances, CpxR-P consuming reactions as k14 and k16 should be lower. However, this signal is not sensitive. What does this mean for Mantis? All three systems are capable of reaching high YFP levels quickly, however not all three systems are equally sensitive. Systems 1 and 3 seem to have a trade-off: the sets producing a maximal YFP production speed do not also reach the maximal YFP concentration. This trade-off is not seen for the second system. For all three systems, the maturation rate of YFP is most important for generating a fast and high signal! When Mantis will be applied in the field, it is not known what concentration of pathogenic marker will be present in the sample of the patient. Mantis must thus be sensitive and be able to detect a wide range of antigen concentrations. To find out which setup is most sensitive, simulations were performed with a range of antigen concentrations. Figure 5: Comparison of in vivo system performance and the performance of the best fitting parameter set. Left: Scores of the best fitting parameter set compared all other sampled parameter sets. The similarity of each parameter set to the data measured by the in vivo system is shown as 'distance' to the in vivo data. Right: Simulation of YFP production by the best fitting parameter set compared to the in vivo data. To improve the current signaling system we want to know which parameters should be changed in order to increase the YFP signal and the response speed. To assess this, each parameter of the best fitting set was individually varied between 0.001 and 100, keeping the other parameters constant. The effect of this change on the maximum achievable YFP concentration and production speed was calculated (Figure 6). We only show the parameters that can potentially be altered in vivo. Figure 6: Left: Effect of parameter variation on the maximum YFP signal (YFP score). Right: Effect of parameter variation on the speed at which the YFP signal is produced (speed score). This figure shows that the maximum YFP fluorescence has more possibility to be improved than the speed at which YFP increases. Both system properties could be profoundly improved by increasing the kinetic rates for antigen binding by the affibody and CpxR-YFPc phosphorylation (find all the used parameters here). However, given the iGEM time limits, it was not feasible to confirm this hypothesis in the lab. One viable option, though, to improve system performance was to use a fluorophore with a faster maturation time. We aim to improve the response time of our visualization system. As stated, our model shows that this can be done by using a faster maturing fluorescent protein. During our "Fluorescent Protein" project we tested a number of fluorescent proteins, of which mVenus showed one of the highest levels of brightness and a high percentage of fluorescence reconstitution. Furthermore mVenus is designed to have a fast and efficient maturation time , exactly what we need! We show here how this experiment was designed, and what conclusions we could make. Taking into account all the simulations shown above, we find system 1 is most sensitive to antigen, most robust and can reach the highest fluorescent signal when the CpxR concentrations are increased. The fastest signal can potentially be produced by system 2, however the required reaction rates are not feasible in vivo. System 3 seems least feasible as a signaling module for Mantis, as it is limited under the wrong CpxR concentrations or parameter values. When comparing the wet-lab data to the sensitivity assay we found that the model could explain the behavior of the in vivo system. In addition, by fitting the wet-lab data to the model, we came up with several suggestions to improve signal production in the wet-lab. For more information on the interaction between the lab-data and these models, look here. More information on construction of the systems in vivo can be found here. X. Zhou, R. Keller, R. Volkmer, N. Krauss, P. Scheerer, and S. Hunke, “Structural basis for two-component system inhibition and pilus sensing by the auxiliary CpxP protein,” J. Biol. Chem., vol. 286, no. 11, pp. 9805–9814, 2011. D. D. Isaac, J. S. Pinkner, S. J. Hultgren, and T. J. Silhavy, “The extracytoplasmic adaptor protein CpxP is degraded with substrate by DegP.,” Proc. Natl. Acad. Sci. U. S. A., vol. 102, no. 49, pp. 17775–17779, 2005. Xiao, Xiao, et al. "On the use of log‐transformation vs. nonlinear regression for analyzing biological power laws." Ecology 92.10 (2011): 1887-1894.